ARENA: Want to see the best of the best? This new scientific zone will feature the 130 best abstracts and provide an opportunity to interact with presenters. e-AREA: Access all of the ESICM LIVES cutting-edge content, digitally, in one central place in the exhibition. BREAKFAST WITH YOUR IDOLS: This new session is an opportunity to have breakfast and interact with a well-known speaker for one hour! (limited number of participants, pre-registration necessary). HOT TOPICS SESSION: Session at the end of the congress devoted to the presentation of cutting-edge research to a very large audience. The 2019 ESICM & Industry Research Awards will be presented to the winners. INTERACTIVE DEBATES: Take part in in-depth discussions about complex problems/situations that clinicians address in daily practice. Experts from various areas of intensive care medicine are invited to speak on a set topic, then the moderator and audience can join the debate. 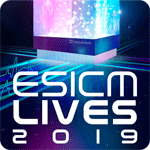 INTERACTIVE SESSIONS: Test your skills and receive immediate feedback thanks to the live voting function in the ESICM LIVES 2019 App. KEYNOTE LECTURE SESSIONS: are the first lecture of each day given by a speaker well-known for his/her expertise in a particular field. The aim is to present issues of primary interest for all participants and to stimulate the younger colleagues towards excellence. LIVESNOTE: Discover our interactive tool LIVESNote, which allows you to make notes on the presentations, directly onto your Tablet. MASTER CLASSES: held on Saturday and/or Sunday prior to the core congress programme. MEMBERS LOUNGE: Relax and network with other members. NEXT LOUNGE: The place for young intensivists and ICM trainees to meet, mingle and enjoy a specially-designed parallel scientific programme. POSTER CORNERS: Abstract presenters will discuss their data in Poster Corner sessions moderated by world-class experts. Presenters will make a 4 minute presentation followed by a 3 minute time slot for comments and discussion by the audience. SIMULATION CENTRE: Interactive area where you can get hands-on practice and follow sessions in Mechanical Ventilation, TEE, ECMO or Basics of bronchoscopy in ICU. TECH LOUNGE: Watch demonstrations of the latest technology to analyse big data, see how telemedicine works and discuss how future developments in technology can change the way we practise. Dynamic sessions where you can participate and contribute to the discussion onsite and via social media.